Public meltdowns and tantrums are common in special needs children, especially when you are taking them out of their comfort zone, and placing them in a situation that is strange to them, and where they feel out of control. Be realistic about the time that you will be spending in public places. All children have very short attention spans, and can tolerate being dragged around shops or doing errands for only so long. Be considerate towards your child, and remind yourself how you feel doing something that you dislike. Dont plan to go out around or past your childs nap time. Children who are tired and irritable are more prone to tantrums and meltdowns. Hungry children are miserable children. Younger children, especially get hungry more often, so take a snack and a juice with you if you know that you are going to be out for a while. Anything that reduces uncertainty, will help to reduce meltdowns. Give your child a visual list of where you are going and the placing you will be visiting while out on your errand. This is very important for a child with special needs, so you can either make cards with pictures of the places you are going to, or cut out pictures from a magazine. Let your child help you make the list and arrange the order of places where you are going, in this way they will be able to anticipate where you are going and what will happen next, making it clear in their minds. Take your list along and every time you have finished one errand, remove the card from the list and ask your child, to tell you where you are going next. This also involves them in what you are doing and once all the cards have been removed from the list, you can take them for a treat, but only if there where no meltdowns. This is a fun way to improve your child's behaviour in general. Let there be opportunities for choices along the way, so that your special needs child can feel more in control, thus preventing public meltdowns. If you know that the trip is going to take a while, build in a break time for a snack and add this to the schedule. You can either place pictures of where you want to go for a snack or what the snack will be. Give your child two or three choices, and let him choose. 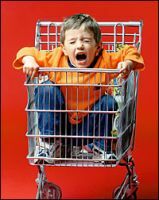 Avoid over stimulating your child, especially in a busy public place like a shopping centre or a mall. Although it is a good idea to talk to your when you are out, dont let the trip turn into a verbal examination, where you are constantly asking them a series questions about what they see and about what is going on around them. They may already be overwhelmed, and the constant questioning can create extra pressure on them, either resulting in a public meltdown or a tantrum .Let your childs interest guide your questions. At all costs avoid a physical struggle. If a meltdown does happen, you may have to physically restrain your child to prevent him harming himself or others, but generally a physical struggle makes things worse. When children with special needs, find comfort in being held, they will see that this as a reward for meltdowns, especially in public, and as a result you may see your child having more, not fewer outbursts. With the right techniques you can avoid public meltdowns and tantrums completely, but this takes time, patience, determination and sometimes just plain guts.